Foothills Christian (gray) goes up for a rebound on Tuesday evening. 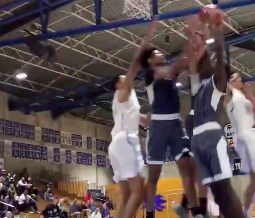 FOOTHILLS CHRISTIAN 62, LA JOLLA COUNTRY DAY 52 – The second-ranked Knights knocked off the sixth-ranked Torreys on the road in a key Coastal League matchup on Tuesday. As a result, FCHS and LJCD are now both 5-2 and tied atop the league standings. The Knights won for the sixth-straight game by pulling away in the fourth quarter. A close game most of the way, Foothills Christian opened a 50-44 lead in the fourth quarter with just over three minutes to play in the game. The Torreys led by one points at halftime. Two minutes later, the lead was 60-48 with 1:11 to play. Senior DERRICK CARTER-HOLLINGER had 24 points to lead Foothills Christian (17-5, 5-2). Knights junior JALAI O’KEITH scored 14 of his 19 points in the final period. Senior guard JAREN NAFARRETE scored 12 points for FCHS. SANTANA 62, MONTE VISTA 60 – The Santana Sultans led when it mattered most, rallying to defeat the visiting Monte Vista Monarchs, 62-60, in a Grossmont Hills League contest on Tuesday evening. Senior DEMARCUS MCKAN led the Monarchs with 19 points. Senior DERRICK WILEY added 14 points for Monte Vista. Senior KENNY STEVENS contributed 12 points for MVHS, making a three-pointer in each quarter. The Monarchs’ MARCO BALHIN nailed a pair of three-pointers in the opening period. MOUNT MIGUEL 84, WEST HILLS 53 – Senior MIKEECE DUNBAR scored 24 points for Mount Miguel and senior teammate MARQUISE EDWARDS added 23, as the Matadors improved to 4-1 in the Grossmont Hills League with the home win over the Wolf Pack. Dunbar had a pair of three-point field goals in each half. “I can say on my team’s behalf that we had a meeting at lunch and we agreed to step our game up,” Dunbar said. “Marquis and I are the top scores on the team, so we continue to do what we do to keep our teammates awake and active. Sophomore KYLE DOBYNS led the Wolf Pack with 19 points and five rebounds. West Hills sophomore guard ASHTON AVESTRO made a pair of three-pointers in the second period. Mount Miguel, which remains a half-game behind first-place Helix, led 43-17 at halftime. West Hills cut the lead eventually to 10 points, but a transition three from Mt. Miguel and another fast break layup sent the Matadors on their way. “We lost all of our energy in the second half,” West Hills coach ELIAS TOTAH said. “We did a good job of weathering the storm in the first half. This game is all about runs and who can execute in critical times, and we just didn’t do that. “I thought MICHAEL TOTAH and Dobyns came ready to play, but we just could not withstand Edwards down on the block. The Wolf Pack will need to win at least one of their final three games in order to have a shot to get into the Division II playoffs. VALHALLA 79, EL CAPITAN 54 – The first-place Norsemen set a school single-season record for most three-pointers made. Senior guard DOMANIC SAFARTA scored 28 points to lead Valhalla. Senior guard JORDAN GAINES added 17 points fot the Norsemen. Valhalla also got 10 points from senior TRE WINS and seven points apiece from senior EVAN O’NEILL and senior MICAH CAMPOS. Valhalla improved to 6-1 in the Grossmont Valley League and 22-3 overall after winning its eighth-straight game. GRANITE HILLS 72, EL CAJON VALLEY 45 – Granite Hills improved to 4-3 in the Grossmont Valley League. Granite Hills (9-13) led 14-9 at the end of the first quarter but extended the lead to 24 points by halftime. The Eagles will have a game at Valhalla on Friday, needing an upset to remain alive for at least a share of the league championship. HIGH TECH NORTH COUNTY 72, LIBERTY CHARTER 66 – The Lions fell on the road as the Raptor outscored LCHS 49-34 in the second half in a game played at the Palomar YMCA in Escondido. Sophomore TYLER SNELL made six three-pointers in the game for Liberty Charter.